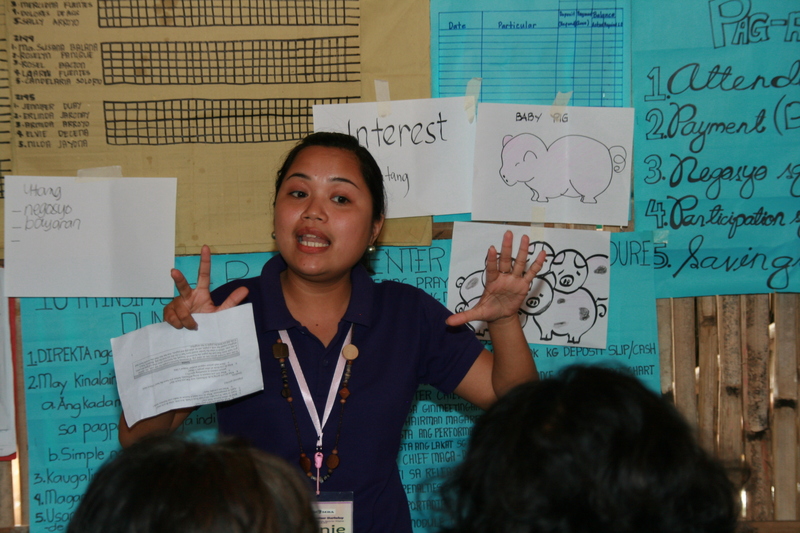 BACOLOD CITY – We spent our last day in the classroom doing another round of practice teaching as a last hurrah before visiting a local NWTF center to teach three lessons to borrowers. We’ve been purposefully nimble in structure the week, and today was no exception. Yesterday, participants told us they wanted more practice teaching. Today, after each small group presented once to half the participants, we divided the entire group into quarters, allowing each participant to practice teaching alone. Some used visuals. Some wrote out simple math. Some made skits. Everyone took a turn. Even the shiest participants taught, using small groups of supportive peers to overcome what in some cases was intense fear of public speaking. We roamed as participants taught, but they so clearly demonstrated command of what they’d learned that it didn’t take long for us to essentially blend into the scenery. Participants took turns facilitating what their peers learned from each lesson, a role we’d played until now. Some took the final learning wrap up a step farther, synthesizing what they’d learned overall, not just from individual lessons. We’re excited to watch them in action tomorrow as they teach NWTF’s clients in a nearby town and look forward to reports of progress in their own communities later. We concluded our classroom teaching with a lesson on measurement, discussing what participants can and already do track and how those metrics might change over time. The participant whose center we’re visiting tomorrow will start tracking right away; the others must wait until they get home. We look forward to meaningful, measured progress from all. Our final review this afternoon quickly turned into a session of heartfelt gratitude, with participants sharing glowing testimonials that public relations professionals could only dream of. One called the Barefoot MBA a master’s degree less the formalities of a university degree. Another committed to implementing it with her entire training department. A third pulled us aside and quietly assured us that the Barefoot MBA was a critical solution for poor people – and that she’d already started sharing it with her counterparts at other organizations. 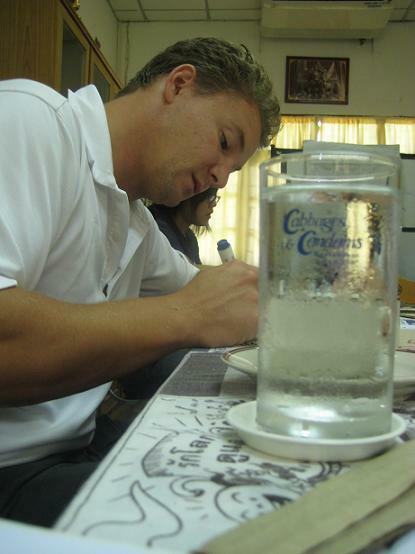 BACOLOD CITY – The excitement in the room today was palpable as participants became teachers of the Barefoot MBA for the first time. They eased into teaching, first by getting comfortable standing in front of a room during the daily morning review of what we’ve learned so far. Some didn’t need to acclimate: asked to teach others what they’d learned, they put on a lively skit mimicking a local newscast. 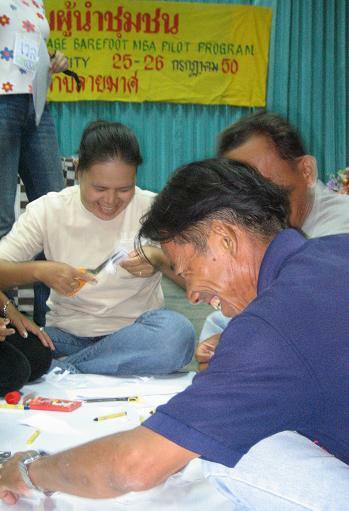 Smiles turned to giggles turned to laughs as participants demonstrated how much they’d internalized the workshop so far. With energy levels high, participants articulated how to keep their students engaged: stand up, make eye contact, apply lessons to students’ lives, smile. (This is, after all, known as the city of smiles.) After a couple role plays as students while we taught lessons from the Barefoot MBA, participants were eager to take center stage again. Participants spent the afternoon preparing to teach in small groups the lessons they adapted yesterday, which last night we retyped and augmented with discussion questions. 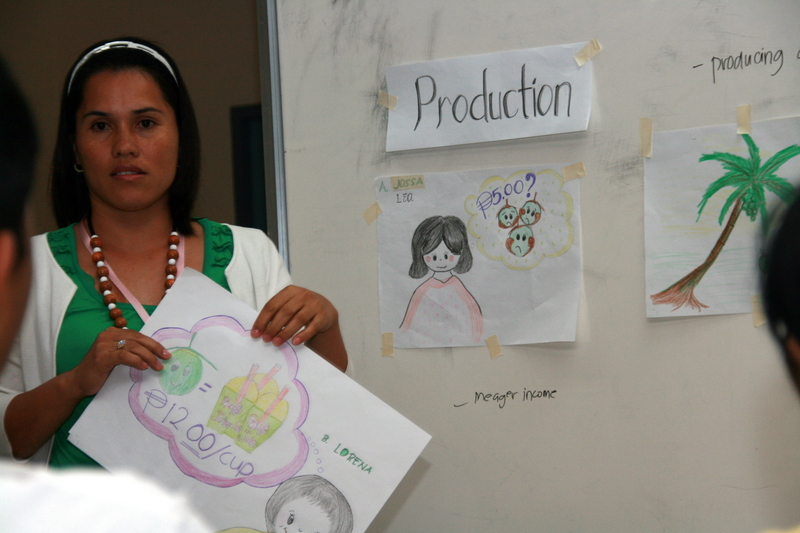 With props, games and pizzazz, groups taught their fellow participants about production and price and competition. Though their lessons were identical in some cases, pedagogies differed, underscoring the Barefoot MBA’s flexibility and adaptability – and reminding us how far we’ve come. Students articulated what they learned: know your audience, make them comfortable, be prepared, be flexible, don’t be distracted by details, practice. Practice, practice, practice. Tomorrow we’ll continue to practice teaching, giving students as many opportunities as possible to practice what they’ve been learning before heading into the field on Friday to teach some of NWTF’s borrowers. 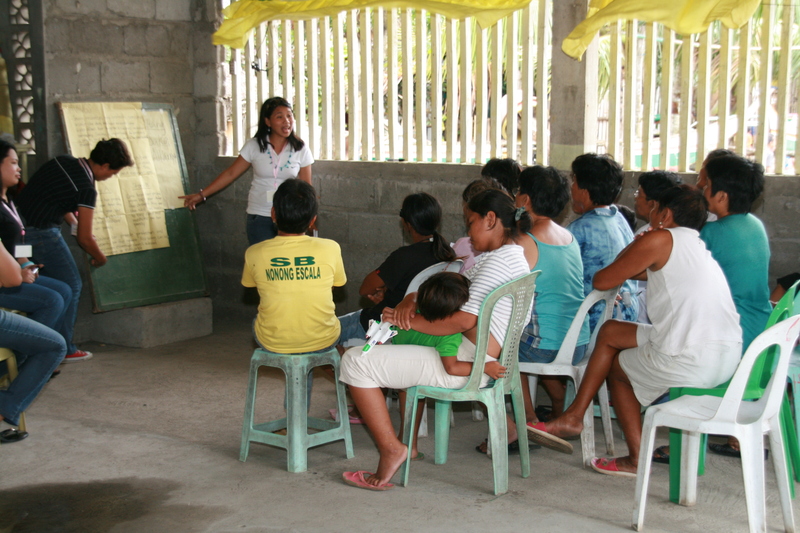 BACOLOD CITY – Day 2 was livelier than Day 1, due at least in part to additional comfort and interaction among participants. Today’s topic was also more tactical: We spent today adapting the Barefoot MBA to local specifications. We designed the Barefoot MBA to be adaptable to anyone, anywhere, but the lynchpin of its success depends on the quality of its adaptation. Today was participants’ opportunity to demonstrate their local expertise and apply it to their clients’ businesses. They were quick, sharp and eager – and by the end of the day made real progress toward adaptations to use with their clients. After reviewing yesterday’s learnings, we started the day with an overview of how to adapt the Barefoot MBA’s lessons. Using lessons included in our adaptation guide, we talked with participants about key issues to consider when adapting the Barefoot MBA’s lessons: What names are relevant? What businesses are appropriate? What market prices make sense to locals? As a group we adapted three sample lessons: saving, investing and spending. We replaced Thai names, items and prices with blanks. We then filled in the blanks one by one, Madlib style. Participants were comfortable adapting the stories by lunchtime and spent the afternoon working in groups of two or three to adapt the remaining stories to local specifications. By the end of the day, each small group had adapted three to five stories, and collectively we completed two full Philippine adaptations and made significant headway on several more. We spent a long evening inputting participants’ handwritten worksheets, quickly understanding teachers’ appreciation for neat handwriting. 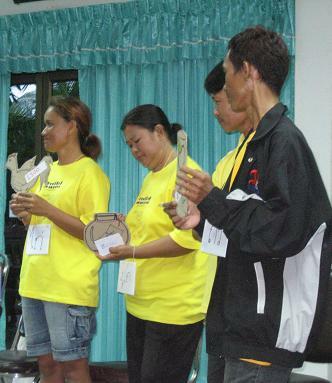 By midday tomorrow, we’ll distribute to each group a customized adaptation based on their work today so they can practice teaching lessons most applicable to their clients. BACOLOD CITY – A large, bold banner at NWTF’s training facility extends a warm welcome to us and the Barefoot MBA. An hour before our scheduled start time today, we arrived to a large multipurpose room – and a handful of students eager to get an early start. We were off to a good start. 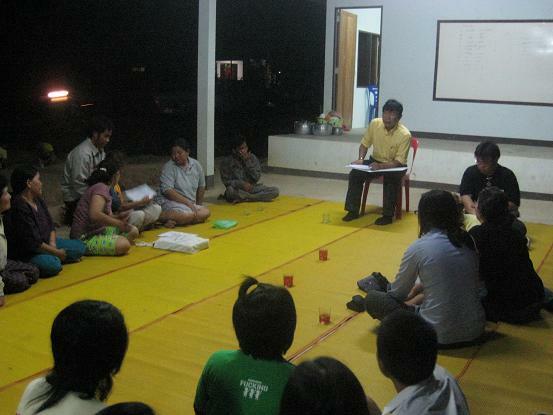 Our participants come from a host of organizations in the Philippines plus one in Cambodia. They represent a mix of ages, genders and locations, emphasizing that the Barefoot MBA can apply to anyone and that we all learn from each other. 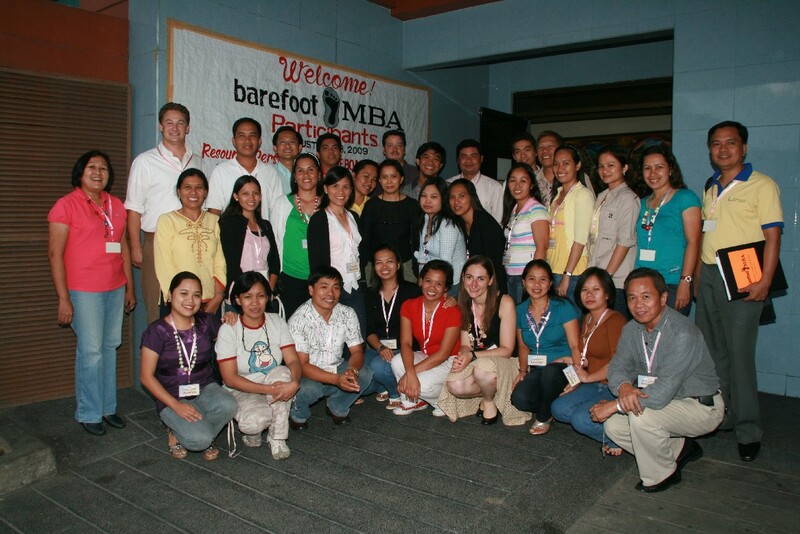 Some knew little about the Barefoot MBA besides its name. Others had poked around our website. At least one had even become a fan on Facebook. All were curious to learn more. And learn they did. We spent most of the morning giving an overview of the Barefoot MBA and each of the seven topics we’ll cover this week: Student selection, lesson selection, timing and schedule, adaptation, teaching lessons, measuring student outcomes, and follow up / monitoring progress. By the time the participants articulated their takeaways from the morning, it was clear just how much we’d conveyed in a short period of time. Different students have different needs, one participant said. The Barefoot MBA is for everyone, said another. We couldn’t disagree. We spent the afternoon on student and lesson selection, grouping the participants by organization so they could discuss how to apply their learnings to their clients. Participants saw that though their organizations and clientele differ, some themes were common. They saw, for example, that farmers and manufacturers have different learning needs and that it’s hard to learn investing without first understanding saving. After a review of the day’s lessons, we enjoyed dinner as a group at a local seafood restaurant, where several NWTF board members joined us. 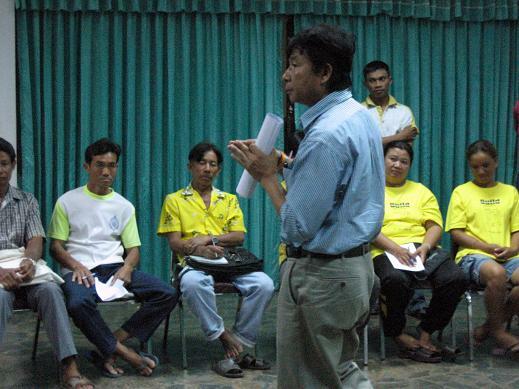 Our schedule is set: A week from today, we’ll start a four-day train-the-trainers workshop in Bacolod City, the Philippines, for about 40 MFI representatives from the Philippines and Cambodia. We’ll give conceptual and hands-on exposure to our basic philosophy, adaptation, and teaching so participants leave ready to implement the Barefoot MBA with their home organizations. We look forward to meeting the lenders and getting started! We hope to send updates from the ground and encourage you to follow along, via blog, Facebook (become a fan! ), and/or Twitter. 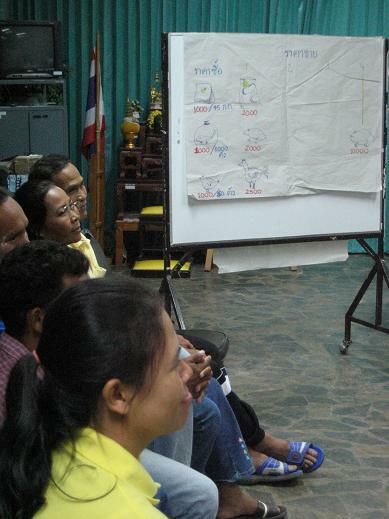 As we mark the second anniversary this month of our Thai pilot, we’re excited to announce a return trip to Southeast Asia with the Barefoot MBA, this time to a train-the-trainers workshop in the Philippines next month. 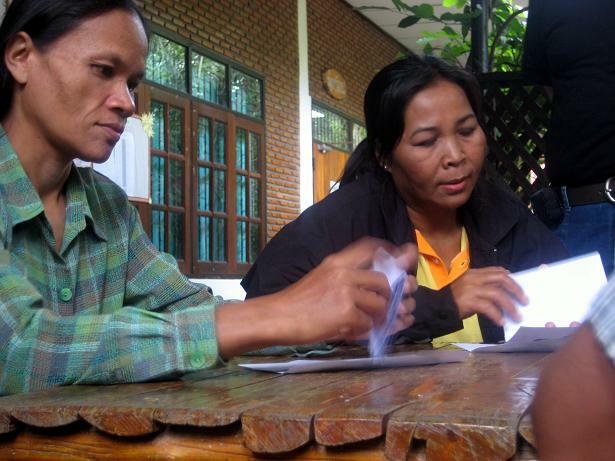 Thanks to support from the Global Initiative to adVance Entrepreneurship (GIVE) and the Negros Women for Tomorrow Foundation (NWTF), we’ll work with representatives from microfinance institutions in the Philippines and Cambodia to adapt and implement the Barefoot MBA. Stay tuned for more details as we finalize them. 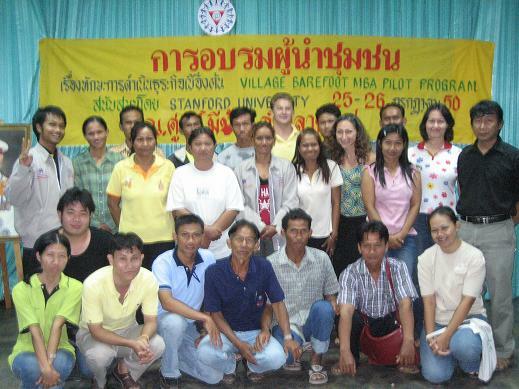 Our original partner in Thailand, PDA, successfully finished a full Barefoot MBA implementation in Lamplaimat, where our original pilot occurred, and is considering new ways to expand and customize the program in other villages. 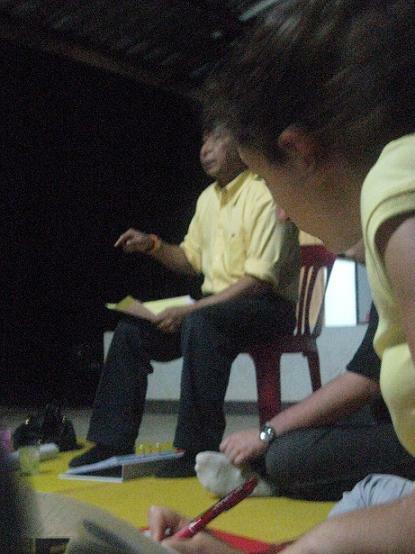 In Guatemala, we strengthened our partnership with a local university and Grameen Bank through teaching the Barefoot MBA’s lessons and translating them into the local dialect to improve efficacy, thanks especially to the tireless efforts of a recent Stanford graduate through the winter of 2009. A partner in India created the first of what we hope will be several adaptations for that country, demonstrating the power of collaboration and the potential of sharing. 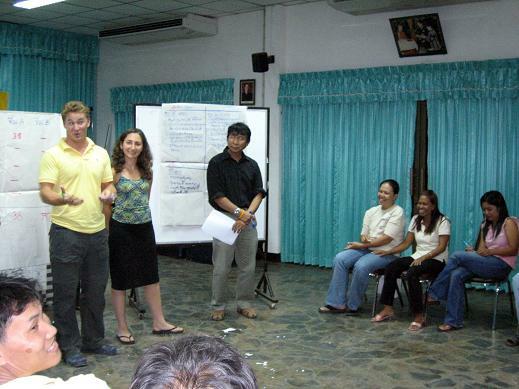 We’re in the early stages of discussion with others, including some in Uganda, Cambodia and the United States, about how best they can use the Barefoot MBA. As always, that’s just what we know. Our blog-turned-website continues to get hits from every inhabited continent, and we continue to hear second- and third-hand of others adapting the Barefoot MBA to their needs. We look forward to another year of progress ahead — and, as always, to continued support and feedback from you. In the meantime, we invite you to join our fledgling social networking efforts by becoming a fan on Facebook and/or following us on Twitter. 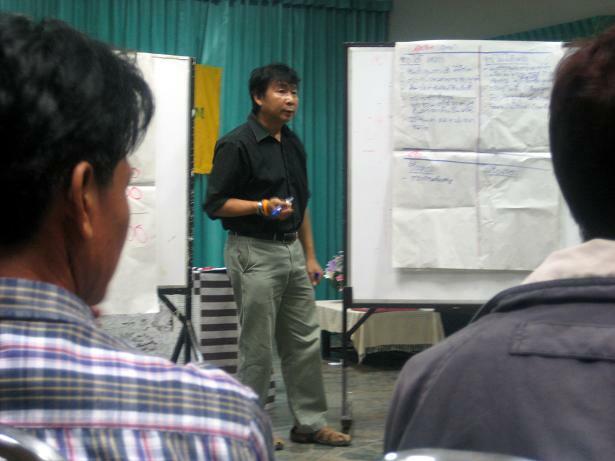 On May 23-24, PDA ran a Train-the-trainer session of the Barefoot MBA. Fourteen PDA operations staff from three PDA centers were taken through the Barefoot MBA Phase I curriculum, both as participants and then as trainers to critique the lesson content and discuss training delivery. We will soon be ready to roll out training to villagers from around these three centers! We have been busy working to dramatically increase the number of our Village Development Partnership (VDP) projects and engaging the private sector. 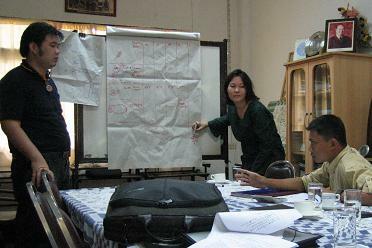 … We are looking at incorporating the Barefoot MBA into our VDP model. As we give villagers access to credit to start/expand their businesses through the Village Development Bank, we also offer them skills to help them succeed in their businesses through the Barefoot MBA. Laura and I just spent 3 ½ weeks in the PDA Lamplaimat center this March, where you were based last time. We went through the remaining 13 modules of the curriculum, along with Khun Prahat, the head of the VDP program (he was previously also the center director). Of these, we decided to discard 3 as they were already covered by other training run by PDA. Working with Somthin (who helped us last time), we adapted and translated the remaining 10 modules, grouping them into 4 learning sessions. Of these, we tested out 2 in pilot sessions, including as many people as we could from the first two pilot sessions. They were also a success, despite a massive storm preventing many of the participants attending the second session! We won’t stop here. We will continue to work on expanding the Barefoot MBA at PDA to include “Study Abroad,” “Internship” and “Networking” stages. As you can see, your work with us almost two years ago has been invaluable in helping us to get started on offering villagers what they desperately need: business knowledge and skills! We’re amazed at what can happen with a little patience. We’re happy to announce that we now have an adaptation for Rajasthan, India. While it may not fit the entire breadth of needs of such a large, diverse country, it is an answer to the requests we have received for adaptations in India. This is yet another example of the collaborative work of individuals and the value of sharing the products of that work. We could not have adapted the curriculum withou sufficient knowledge of local customs, and Pulkit, the author of this adaptation, likely would have spent his time building a teaching tool from scratch. As always, we encourage people to share their work, and we will continue to do likewise. Thanks to Pulkit for his work, to those who have shared the lessons in the Barefoot MBA with others, and to those who share their adaptations with us. Progress independent of our day-to-day effort continues, this time back in Thailand with PDA. We’ve been in touch with Laura, an intern from Michigan State who’s expanding the Barefoot MBA’s reach in Lamplaimat, where we piloted the first lessons. During her seven-week internship, Laura has been adapting and implementing several lessons with PDA. The first three weeks of the internship I was working out of the PDA Bangkok office, and just getting acquainted with the organization. I made a couple site visits up here to Issan to check out some VDP villages. For the second half of the internship though, Anita and I have been making the trek to Lamplaimat for the past couple of weeks, and working on adapting/translating 8 more modules. In most cases we’ve combined at least two modules together, creating a session that covers two related topics. Because you guys have already created the lesson outlines, the hardest part has just been coming up with activities that will keep the villagers involved and hold their attention. For one of the lessons I wrote a skit about loans and interests, and we’ve made up an activity about selling fruit in the market to teach about specialization. I’m still working on writing examples for the Planning and Records lesson. We’ve created some basic charts to show the villagers, and we want to be able to walk them through how to keep their records using them. 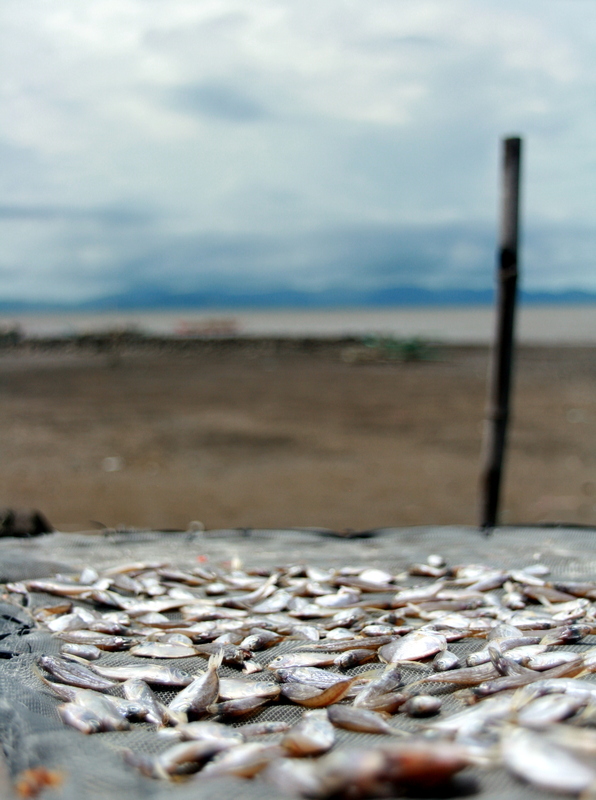 Laura is keeping a blog complete with photos and stories that harken back to our time in Thailand. We look forward to her regular updates — and, ultimately, to her final report. 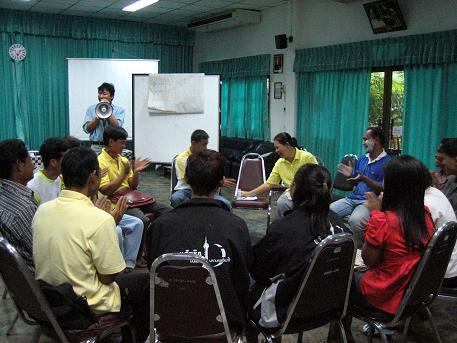 BANGKOK, August 3 – Our final meeting with Khun Mechai went well. In the lounge of the restaurant whose profits PDA uses to support programs for villagers like the ones we met, and using the bar’s television as a projector screen, we recapped our progress and takeaways for Khun Mechai and two of the PDA staff members with whom we worked closely. We agreed that the pilot in Lamplaimat was a success and talked eagerly of ways to build upon the work we’ve done: teach more lessons, require the entire curriculum as a prerequisite to securing a micro-loan from PDA, collaborate with other organizations to strengthen existing efforts and expand to additional villages worldwide. If we didn’t have other commitments waiting for us at home, we’d tackle that list and more. With limited resources, we agreed to adapt our already written stories with market examples relevant to the villagers we met and to brainstorm ideas for additional activities that reinforce our stories’ lessons by engaging and involving students. And so, like all good things, our time here must end. We are leaving Thailand but not the Barefoot MBA, PDA but not the mission it espouses. Our work here has been challenging and rewarding, eye-opening and inspiring. It’s been remarkable to watch this project evolve over the last seven months from an informal conversation on the beach to the most formal education a roomful of Thai villagers had seen in years. Despite not understanding more than a word or two from our students, the looks on their faces tell us we’ve created something worthwhile – and have a long way to go. We’ve learned from the villagers while they’ve learned from our curriculum and look forward to following their continued success. We welcome your thoughts and suggestions, as well. This ends the regular blog updates (for now). Thanks for reading!